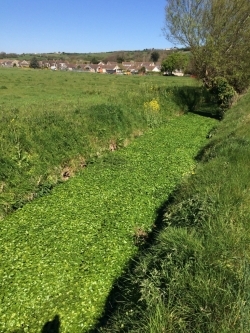 The Axe Brue Drainage Board has changed the maintenance of the main drainage ditches (rhynes) in Bleadon this year to try to eradicate the invasive alien plant Floating Pennywort, which is a serious threat to the ditch ecology and drainage of the area. 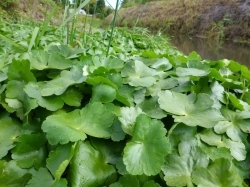 Floating Pennywort is a recent introduction to this country and was first identified in Bleadon in 2007. It is thought to be an escapee from a private garden. It is very fast growing and out-competes our native plants. 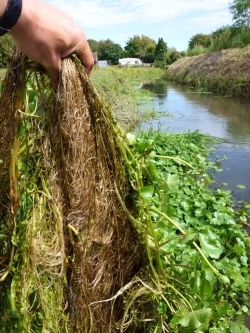 It can grow up to 20cm a day and spreads to block out light for other aquatic plants and can impede water flow and block culverts and structures. This is not a problem that can be solved overnight, but perseverance with regular spraying and vegetation removal is keeping the plant in check and has stopped it spreading to other areas, including the River Axe. We have to keep returning to the site every year in order to keep the plant under control which takes time and money. 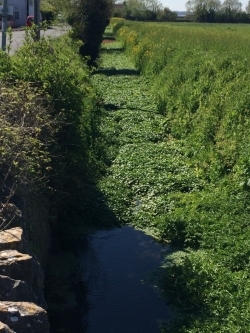 This year we have increased our efforts and hope to remove Floating Pennywort from the local drainage system completely. If we are able to eradicate it from the ditches in Bleadon, it will greatly improve the ecology of the ditches and help protect the village from flooding. It will also enable the Drainage Board to return to a more ecologically sympathetic and less expensive maintenance regime, with less frequent and less severe management. The eradication of Floating Pennywort is being undertaken by our own experienced Drainage Board staff. We are working closely with the Environment Agency, who are undertaking the herbicide spraying this year, and Natural England, who have requested that we undertake this work. We have also taken specialist advice from other areas where Floating Pennywort has been eradicated successfully. The work this year will combine mechanical removal, careful use of herbicides and hand picking of plants. It is vital that this work is thorough and consistent as Floating Pennywork can very quickly regrow and spread from small fragments that can overwinter in ditch banks. We hope this helps explain what the Drainage Board is doing in Bleadon and why we are undertaking this work. We would be happy to come and discuss this with local residents, so please get in touch if you would like us to attend a Parish Council meeting or organise a site visit. We are also happy to provide you with updates on how the work is progressing over the next few months and years.